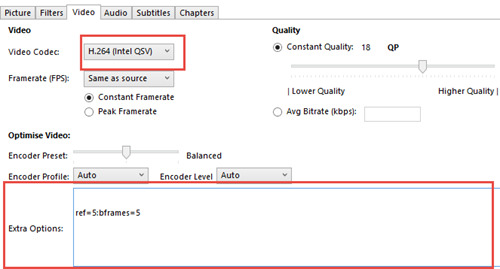 Follow this guide to enable Intel QSV on HandBrake 1.0.0/1.1.0 achieving faster DVD to MP4 (H.264) ripping speed. HandBrake eventually released 1.0.0 with surprised new features and giant improvement through over 13 years in development. This famed open-source video transcoder offers a brand-new preset list. Besides original presets which are placed in "Legacy" category, new general, web, devices and MKV presets are available. Fresh video/audio codecs, including VP9, Opus, E-AC-3, FLAC, TrueHD are fully supported. HandBrake also brought new changes on video filter, subtitles and chapter. Well, the highlight of HandBrake 1.0.0 must be the support of Intel Quick Sync Video (QSV), which greatly improves its performance producing a fast transcoding speed. When it comes to 1.1.0 released in April 2018, Intel QSV support was further improved for HEVC/H.265 encoding. Have no idea about Intel QSV for HandBrake? Here, we will give an explanation of HandBrake Quick Sync and tell you how to enable Intel QSV on HandBrake 1.0.0/1.1.0 for better performance on DVD to MP4 (H.264/H.265) ripping. We rejoice in HandBrake's improvements on 1.0.0, especially for Intel QSV support. But it still fails to handle copy-protected DVDs. 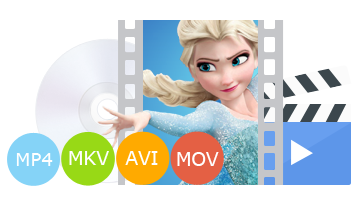 WinX DVD Ripper Platinum is an ideal replacement helping us rip any unencrypted and encrypted DVDs to various formats, devices and web videos, like DVD to MP4, AVI, MOV, FLV, iPhone, iPad, Android and Windows devices, YouTube, Facebook with no effort at all. It invokes not only Intel QSV but NVIDIA NVENC to deliver the most efficient performance for DVD video encoding, decoing and processing. The unique level-3 hardware acceleration tech used by this best HandBrake alternative can also hlep deliver very high quality of resulting file, almost lossless. Intel Quick Sync Video is a hardware core aiming to quickly and easily transcode a video from one format (DVD/Blu-ray included) to another, create and edit video by using the dedicated video encoding and decoding capabilities of Intel Graphics Technology. This hardware accelerated video encoding technology shows a comparable result to x264 superface preset in speed, compression ratio and quality. At present, Intel QSV decoding of H.264, MPEG-4 and VC-1 is widely supported by transcoders/players, like HandBrake (1.0.0 and later), VLC, WinX HD Video Converter Deluxe and more. HandBrake Intel QSV is only available when you running on a qualified computer, which requires Intel Skylake or newer CPU (2nd generation or newer Intel Core Ix Series processor with integrated Intel HD Graphics enabled). As a matter of fact, the better processor and graphics your computer has, higher encoding performance at a better quality will be. HandBrake 1.0.0/1 uses Quick Sync encoder for H.264 encoding. Compared with x264 encoder, Quick Sync delivers faster transcoding speed and occupies lower CPU usage. 1. Download HandBrake 1.0.0 or 1.1.0 (64 bit) for Windows Vista or later from handbrake.fr and install it. 2. After finishing installation, launch HandBrake. Take ripping DVD to MP4 as example. Click Open Source button to import DVD disc (VIDEO_TS folder or ISO image) into HandBrake. 3.Later, move to Video tab and choose H.264 (Intel QSV) as video codec which is available for both MP4 and MKV container. 4. If necessary, you can set available HandBrake Quick Sync options to adjust parameters (frames, bitrate etc.) by inputting following string into Extra Options box. Quick Sync indeed accelerates ripping speed but meanwhile problems emerge. After a test, we get a lower quality resulting file with larger size when using Quick Sync on HandBrake than using x264. If we want to get a reasonable quality, a better GPU is needed. Besides those limitations of Quick Sync, HandBrake also has no breakthrough on copy-protected DVDs. If you want to decode an encrypted DVD to digital file with high quality at a fast speed, the best HandBreak alternative – WinX DVD Ripper Platinum can satisfy you! WinX DVD Ripper Platinum is a professional DVD ripper featuring converting almost all sorts of DVDs to MP4 (H.264/H.265), AVI, WMV, MOV, FLV, 3GP, MP3, AAC, AC3 etc. quickly and easily. Apart from general video/audio formats, it offers various devices/web profiles, including iPhone, iPad, iPod, Apple TV, Android/Windows smartphones/tablets, Xbox, PS3/4, Facebook, YouTube and more. It can bypass various copy protections on DVD, such as CSS, region code, RCE, Sony ArccOS, UOPs, Disney DRM and special schemes on newly released DVD movies/TV shows, workout DVDs and so on. Thanks to level-3 hardware acceleration tech with integration of Intel QSV, NVIDIA NEVNC, it gives the fastest DVD ripping speed while keeping nearly lossless quality. Handbrake Tutorial | How to Enable NVENC Encoder?